It’s super cold outside today! The only thing that’s going to warm me up, is a pan of chocolate chip brownies. What could make a pan of already delicious brownies even better? Adding mashed bananas to the brownie batter, that’s what! Topping the brownies with a chocolate, peanut butter glaze, well that’s just plain genius. Chocolate chip banana brownies with a chocolate peanut butter glaze are super, duper delicious! This chocolate peanut butter glaze is amazing. It’s delicious on everything from brownies to mounds bars. Peanut butter and chocolate chips are melted together, then spread over the brownies. Valentine sprinkles are scattered over the glaze but this step is optional. The sprinkles are optional but who doesn’t like sprinkles? 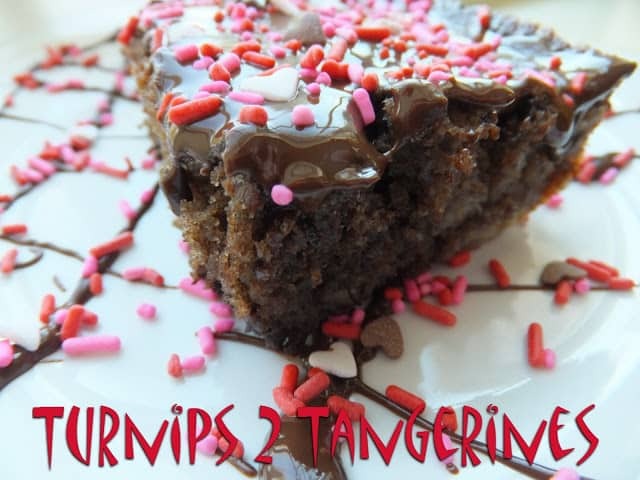 They certainly make the brownies look more festive with the Valentine sprinkles on top, don’t you think so? 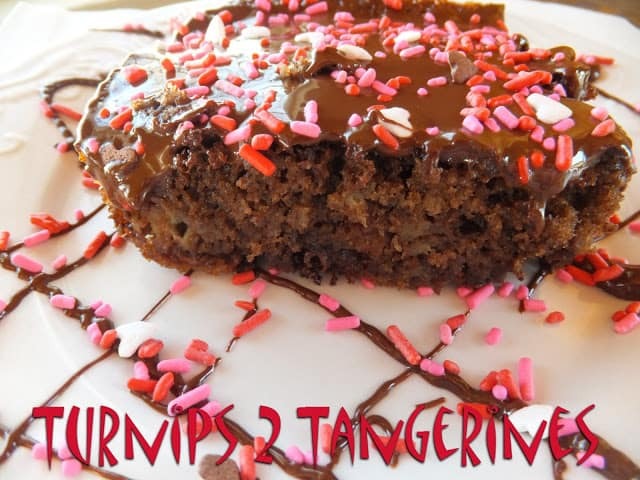 Looking for more Valentine inspired recipes?? We have several we know your going to really want to try. Here is just a sample. Black Bottom Banana Bars , Valentine Popcorn Balls, Valentine Chocolate Chip Cookies and Valentine Sandwich Cookies. To find more delicious recipes, check out our Recipe Box. For all of your ‘sprinkle’ needs, stop by Fancy Sprinkles. Mashed banana's and chocolate chips make this brownies special but the peanut butter and chocolate glaze takes these brownies over the top. Make brownies. Preheat oven to 375 degrees. In a medium bowl combine melted butter, sugar, and cocoa. Whisk in eggs, cold coffee or water and vanilla extract. In a small bowl combine flour, baking powder and salt. Gently stir into egg mixture until combined. Stir in mashed bananas and semi sweet chocolate chips. Spread into a lightly greased 2-quart baking dish. Bake at 375 degrees for 25-30 minutes or until toothpick inserted in the middle comes out clean. Remove from oven and cool on wire rack. When brownies are cool, make glaze. In a microwave-safe bowl, combine chocolate chips and peanut butter. Microwave on high for one minute or until chips are melted. Stir until smooth. Spread over cooled brownies. 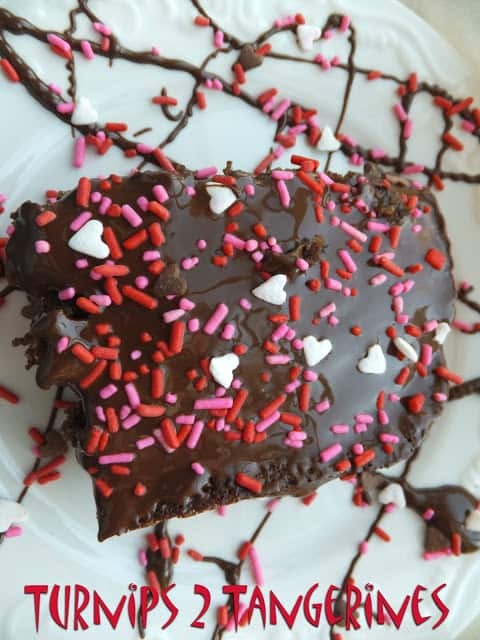 Sprinkle brownies with Valentine sprinkles, optional. First I have to say that I cannot fathom -5! It was almost 70 here today–very spring like day. Second, I love this combination of chocolate, banana, and PB in a brownie. Drooling! Thanks for linking up with See Ya in the Gumbo! Thanks so much for stopping by from the link up and for following! Thanks for the invite and I'm on my way! These sound terrific! New GFC follower from the Sunday Social link-up. If you would like to share these on the Creative Corner Hop the link will remain open all week. We'd love to see you there! Hi Lynn, I’m Anne from Life on the Funny Farm (http://annesfunnyfarm.blogspot.com), and I’m visiting from the Clever Chick’s Blog Hop. These look and sound so delicious! Your presentation is so pretty, too. Can't wait to give it a try! Oh yes, these look absolutely fabulous! Got my mouth watering. 🙂 Thanks for following The Thriftiness Miss too. GFC following you back now. Hope you have a great day! Thank you for stopping by! Have a Great Week! These sound good! A blend of our favorite tastes. Thanks! Glad you stopped by!